I was bopping around the internet, stopping by some forums, throwing out virtual hugs, high-fives, and the occasional, “have you tried…” suggestions to desperate parents. Too many times, I ran up against one of those comments. The one that makes you cringe, because you know it sent a knife straight from the screen and into the tender-shoot of a struggling mom’s heart. Each person reading this page (self included) has a million things going on right now, feeding into the larger context of this “parenting” thing we’re all trying so hard to ace. Those “let me tell you why I’m better than you” kind of comments are so frustratingly pointless. It’s taking something incredibly complicated (like Quantum Mechanics) and trying to squeeze it into a toddler toy. True, the breastfeeding/formula, working mom/sahm, organic/who cares, categories seem like they should fit inside the standard “square, circle, triangle, star” holes of life. But life is so much messier than what we’d like it to be. Life is really more like a Jackson Pollock, when everyone wants to act like it’s paint-by-numbers. I’m hereby declaring this The Year of the Phoenix. This is the year that moms who have felt the flash-burn of judgment turn that pain into a glorious beacon of encouragement for the moms coming after them. We will use those not-so-good memories to fuel a new passion: building up a fresh generation of empowered and confident mothers. We’re all a mess, really. Let’s be real with one another. This is why I decided to become a panelist in the Sisterhood of Motherhood program. The video below will show you why I couldn’t resist hitching my wagon to the kindness campaign. It left you scowling. Defensive. Hurt. Bury those ashes. 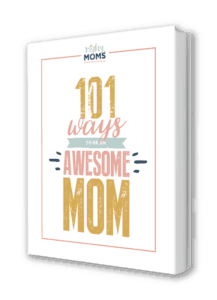 Remind yourself of the 101 ways you’re an awesome mom. And then, deep inside let your heart stir…hatch…take flight. Let the pain of those judgmental and hurtful comments push you to do more for the new moms coming up behind you. The ones with eyes as big as saucers who are so utterly overwhelmed with it all. Take your wings and surround those newbies in acceptance, encouragement, kindness… It’s a beautiful thing, this Sisterhood of Mothers. Does your heart have healing to do? How have others affected your mom-esteem? For good? or for evil? This article really uplifts my spirits. As a new mom, I’ve been constantly given advises by my in-laws, my husbands aunts and even strangers how to raise my child. It irks me sometimes because some of the things they tell me doesn’t go with my guts. Like they tell me to not rock my baby to sleep because it would be hard to break it later or constantly cuddling with my daughter because she would be dependent on me “forever”. I mean, my daughter’s just two months old and they mean well but sometimes what they tell me doesn’t apply to my baby sometimes. I think I have a high-need baby and its hard to explain it to them that my baby is not just the same with their babies. I’m so glad this article encouraged you. We really believe you should trust your mama instincts. God made you your baby’s mama for a reason! Great article! Love those positive vibes! I don’t know if it was experience or age. There’s a 15 year gap between my kids. It’s probably a combination of both. Either way I agree. I know I made judgments based on what I thought I knew, but I kept those judgments to myself. I grew as a person and realized I don’t know as much as I thought I did way back when. It just kills me when I see parents (especially those who should have the experience to know better) criticizing other parents over the dumbest stuff – like not having a sit down family dinner every night even though the husband works nights, or whether or not their kids are allowed to use any electronics, or whether they use a stroller or babywear. I don’t get it. Are your kids happy, as healthy as circumstances allow, and loved? Then you’re doing your job. How you get that job done shouldn’t matter to me or anyone else. Amen. When the sanctimommies start organizing, reading a parenting blog feel more like facing down the armies of Mordor. Do what’s best for your family, don’t hurt mine, and we’re all good. I don’t know about you, but I found for myself that a “critical mommy spirit” came out of my own insecurities. As I have had more experience and the years have gone by I am more secure in my parenting and MUCH less critical of others!